The NLP Meta Model is a set of language patterns that reconnects the deletions, distortions and generalisations that occur in everyday language use with the experience that generated them. Recovers them from the deep structure. Deletion – something important is left out of the sentence. This limits thought and action. Generalisations – we create categories or classes from single examples, by chunking (organising information into groups or “chunks”). 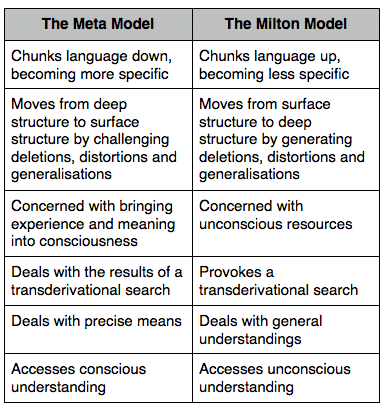 Meta Model is used to bring people out of trance, Milton Model used to induce trance. Directed questioning for a specific result. How have you failed to resolve this? How can you overcome the solution to your problem? When will you stop it from being a limitation? How many ways do you know you have solved this? State – I know you are changing and seeing things differently. This is an NLP Master Practitioner subject and is taught by Excellence Assured in our NLP training online at our e-Learning centre.